Whether you’re running your first marathon or trying to cut a few seconds off of your personal best time, our coaches can help. Coaches Joe English and Dean Hebert are expert on-line coaches who can help you achieve your athletic goals. Our coaches have honed their crafts working in person with groups and indivuduals through their practices in Portland and Arizona. 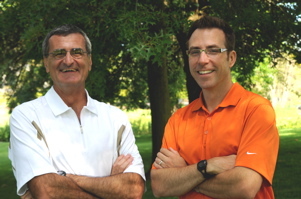 As on-line coaches, Coaches Joe and Dean bring their expertise to you wherever you happen to be. We’ll interact with you through e-mail and phone to craft the training plans that you’ll need to reach your goals. How does coaching over the Internet work? We meet with you over the phone and correspond over e-mail. After talking with you about your needs, we develop a customized schedule to help you tackle your marathon goals. Then we follow your progress along the way by e-mail and telephone conferences at a frequency that works for you. You’ll received personalized and caring attention from your coach, wherever you happen to live. Our programs are great for runners that need direction in their training, custom training plans, a source motivation and or a little encouragement. We use the latest methods that seek quality over quantity to increase performance and endurance, while reducing the risk of injury. If you’ve tried standardized coaching programs from books or magazines, you know that having a coach to call or e-mail when something goes wrong is absolutely essential. Our expertise comes into play in helping you when you hit the bumps in the road. And since your schedule is personalized to your needs, we’ll help ensure that you get the most of your training. Prices will vary depending on your needs. A basic program would start with a schedule of 4-6 months to train you for your first or next marathon, half-marathon or triathlon. Coach Joe English is also available for personal consultation, speaking opportunities and training in the Portland, Oregon area. Coach Dean Hebert is available for in-person coaching in the Tempe/Phoenix Arizona area. Don’t know what you need? That’s OK. Just ask. To contact us by e-mail, just click here. To contact us by e-mail, just click here.